The second annual Prescott Bike Festival to raise funds for, and awareness of, the Nationwide Association of Blood Bikes and one of its member groups, Severn Freewheelers (SFW) takes place on Sunday 22 April. Members of Blood Bike groups give their time free to transport blood and other medical items on behalf of the NHS – helping to save lives and taxpayers’ money in the process. SFW was founded in March 2007 and by the end of 2011 the volunteers had responded to 11,400 calls, with 400 in December 2011 alone. It has a team of 80 active riders and another 40 active volunteers assisting with telephone co-ordination of the riders and with fund-raising. The operations are divided into three areas: Hereford & Worcester, Gloucestershire, and North Wiltshire, together covering an area 80 miles by 50, from Birmingham to Marlborough and from Hereford to Burford. Scott Redding from Gloucestershire, the youngest rider to win a Grand Prix when he triumphed in the British 125GP at Donington Park in 2008 and now one of the top riders in the ultra-competitive Moto2 class, who will officially open the event. Redline Racing with Tarran McKenzie and his three times BSB winning dad, Niall McKenzie. John Reynolds, Nationwide Association of Blood Bikes Ambassador and multiple British Superbike champion. Taylor McKenzie, a competitor in the MotoGP 125cc World Championship. Martin Robbins, British Hill Climb champion. Chris Hodgson, twice British Supermoto champion. 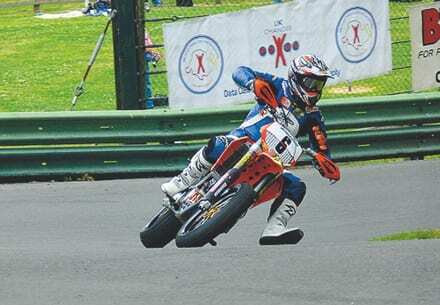 Richard Blakeman, a member of the British Supermoto team. The AP Kawasaki BSB Team run by Paul Russo and with riders Freddie Russo, Anthony Haywood and Leon Hunt. The Prescott Bike Festival will feature a Race Bikes Thru’ the Ages display with visitors able to get up close with rare exotica, early pioneering machinery, modern MotoGP bikes and more as well as see many of them in action, ridden by race riders. Nearly all of the 200 tickets for visitors to Run the Hill on their own bikes have now been sold so to avoid disappointment visitors should visit Prescott Bike Festival website. A few lucky visitors can be a passenger in a Formula 2 Honda sidecar outfit fitted with a CBR600FW engine. There will be a limited number of tickets available at the Festival and passengers will need full motorcycle gear and must be over 18. Martin Robbins, 2011 British Hill Climb Champion, is also offering pillion rides on his Yamaha TRX 850 hill climb racer – if you dare! Again only a limited number of tickets will be available at the Festival and restrictions apply. The 2012 Festival will include a children’s demo area, a new Orchard Food & Bar Village, a Run the Hill Fancy Dress competition, paddock fun with a tribute act dedicated to the famous George Formby motorcycle film, No Limit, and live entertainment from UK hot rocking band, Josie and the Outlaw. Prescott Bike Festival will take place on Sunday 22nd April 2012 and all proceeds from the day will go to the Nationwide Association of Blood Bikes and Severn Freewheelers. Advance tickets can be purchased via the Prescott Bike Festival website. Thank you so much for the tickets to Prescott Bike Festival. What nice people they are there, so helpful & cheerful even when the rain is falling like stair rods, the whole day was a great success & I hope loads of dosh was raised for the Blood Bikes. Well done to all the dealers and stall holders who turned out, at so many events these days many don’t seem to be bothered, they all kept the fun going in style. The vision of blokes in full leathers purched on mini-motos and Zippy heading up the hill will stay with me for a long time! Thankyou, Fast Bikes, for a superb day out.